MathCloud is an online tool for teaching mathematics. It allows students to learn at their own pace and uses a variety of learning tools, including videos, to support learning. Photo credit: ADB. MathCloud, an online mathematics teaching tool, offers an alternative learning approach for countries seeking to raise their levels of maths proficiency. MathCloud is an online tool for teaching mathematics that has had positive results in boosting learning outcomes in Asia and the United States. 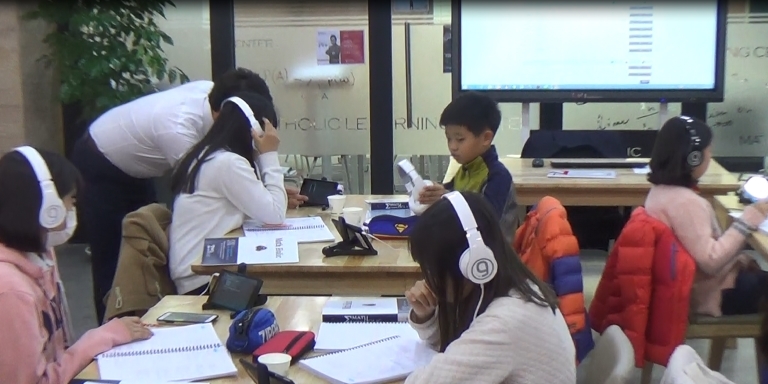 At an information and communication technology (ICT) in education workshop organized by the Asian Development Bank (ADB) in Seoul in November 2016, Seunghoon Ji, one of MathCloud’s co-creators, explained how the service works and how it offers a viable alternative for teaching mathematics both inside and outside the classroom. MathCloud is a joint Republic of Korea and United States-developed software, which was launched in 2009. Its development stemmed from concerns that traditional teaching methods were not effective enough in helping students understand mathematics concepts, resulting in low critical thinking skills and poor academic outcomes. The software incorporates an adaptive feature, which allows it to monitor and "learn" from the user's work, and to provide follow-up questions. A practice function provides problems that are selected to reflect the user's weak areas. The service also includes a "personalized visual maths concept dictionary" or "cloud" to help users better understand relationships between concepts. A variety of learning tools, including videos, are used to support learning. The key benefits of the system are its focus on understanding concepts rather than simply memorizing solutions to one-off problems. It also allows students to learn at their own pace and location. A communications function provides parents with real-time assessments of their child's progress. The software can be employed as a standalone tool in classrooms or as a supplementary service to students outside school hours. It is also easily customizable for local languages and content. Although MathCloud is particularly effective at the middle school level when many mathematics concepts are first introduced, it has much broader application and is used from preschool right through to university level. The software is being used in the US, the Middle East and in Asia where customized local versions have been trialed in Bhutan, Lao People's Democratic Republic, Sri Lanka, and Viet Nam. Results from before and after use of the tool have shown substantial gains in both proficiency and understanding of maths concepts. In Sri Lanka, performance evaluation reports from an ADB-assisted pilot project using MathCloud found the system effective in improving proficiency, understanding of concepts, and interest in the subject. In the US, a public high school in New Jersey using the system recorded a 60% improvement in learning outcomes over non-users, and a private school in Virginia recorded improvements in scores for 9 out of 10 students using the system to prepare for the SAT college entrance exam. Asian Development Bank (ADB). ICT in Education. ADB. 2011. Technical Assistance for Learning from e-Learning: Testing Intelligent Learning Systems in South Asian Countries. Manila. My Personal Data Analysis Co., Ltd.
S. Ji. MathCloud in the World. Slideshow presentation at the Knowledge Sharing Program on ICT in Education of Asian Development Bank. Seoul. 9-11 November 2016. Seunghoon Ji is cofounder and general manager of MPDA Co, Ltd, which created MathCloud. He has led a teacher training project with the Republic of Korea’s Ministry of Education involving 16 countries, and helped design an Online Math Olympiad. Ji also manages the Sri Lankan component of a regional project trialing the use of MathCloud.